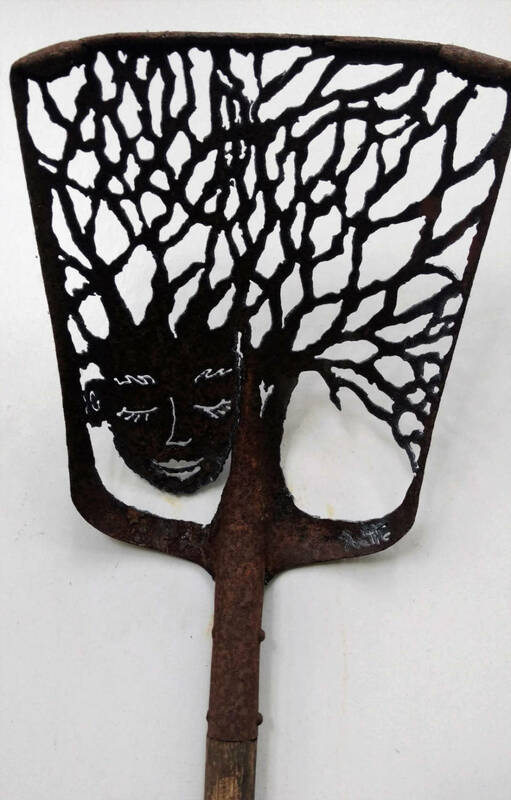 Design hand-cut into a shovel with a plasma cutter. 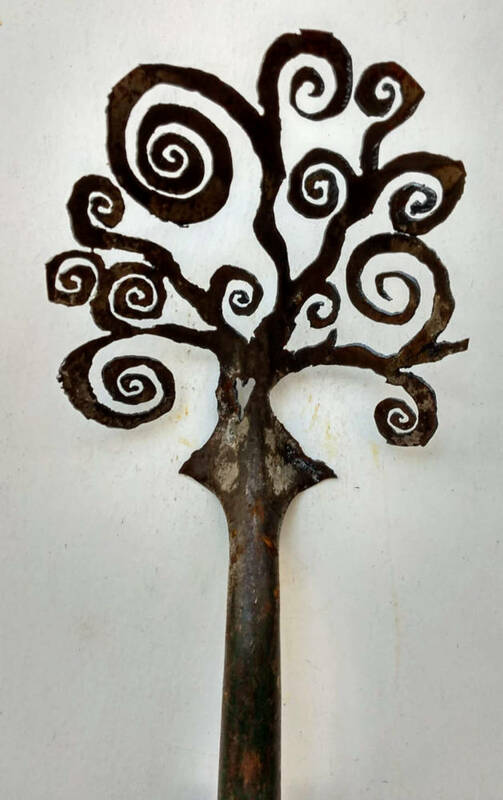 Spiral tree design hand-cut into a spade witha plasma cutter. 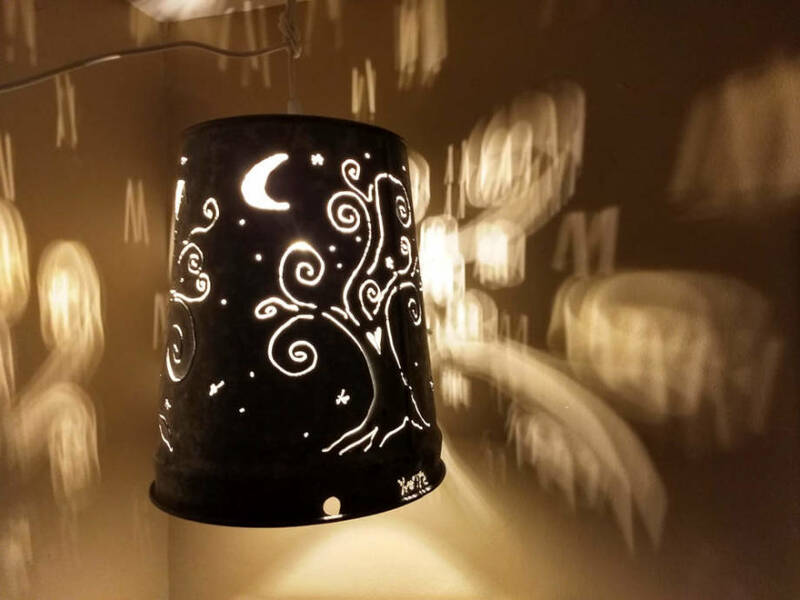 Spiral trees and moon design hand-cut into a galvanized maple syrup bucket and converted into a hanging lamp. Comes with lamp cord with switch and plug, and one edison LED bulb. 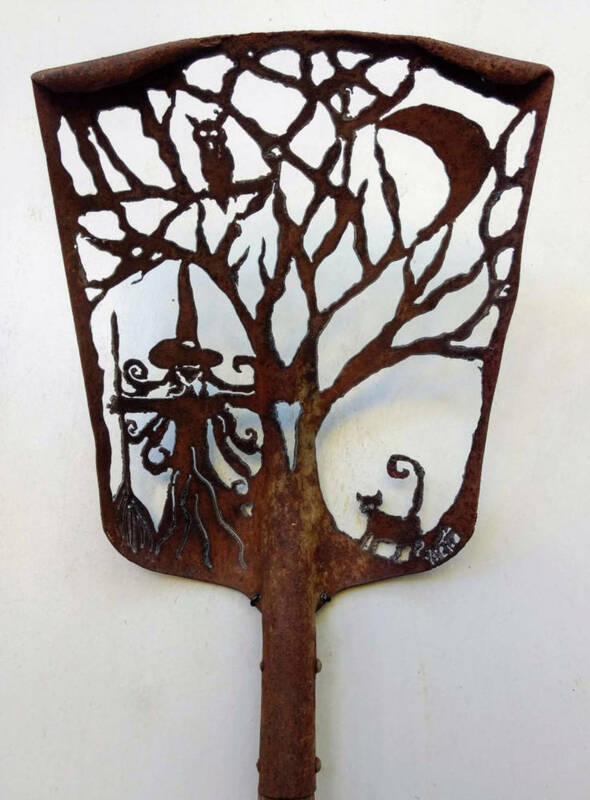 Tree with owl design hand-cut into a shovel with a plasma cutter. Design hand-cut into a metal-weave tabletop with a plasma cutter. Measures approx. 48" diameter. 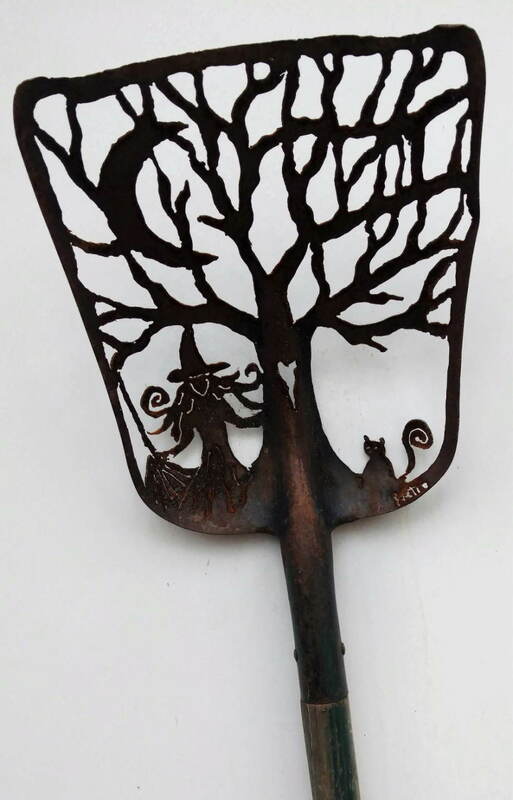 Witch and tree design hand-cut into a shovel with a plasma cutter. 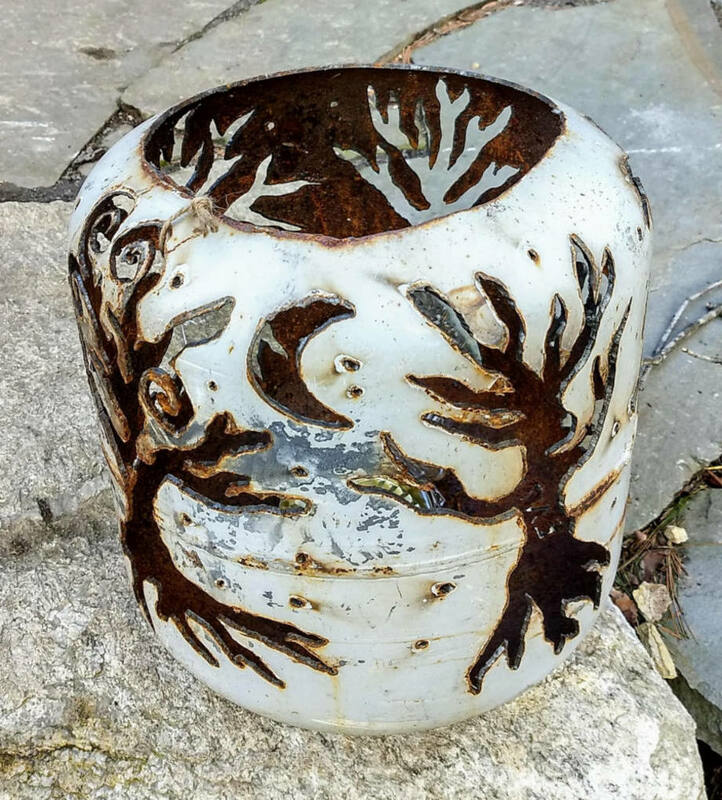 Tree spirits design hand-cut into a recycled propane tank with a plasma cutter. Comes with an outdoor torch candle. 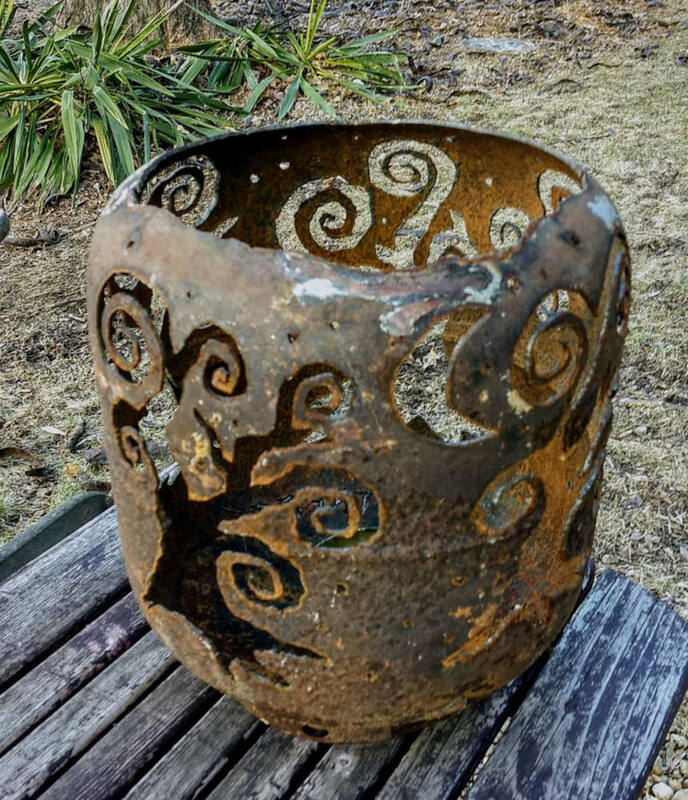 Spiral Trees design hand-cut into a recycled propane tank with a plasma cutter. Comes with an outdoor torch candle. 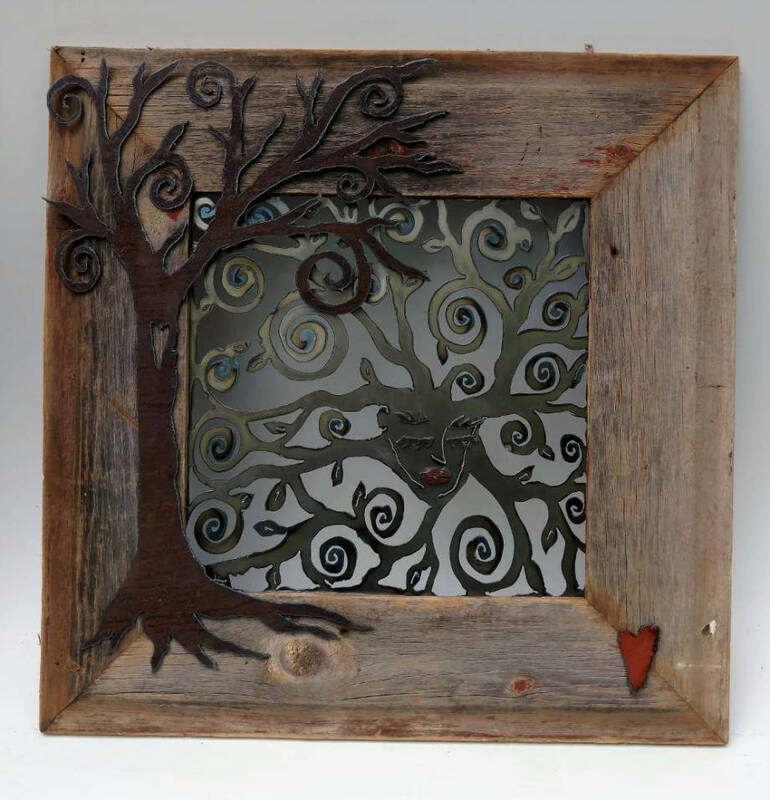 Design hand-cut into steel, with copper moon accent, set in a barnwood frame. Measures approx. 36" x 24". 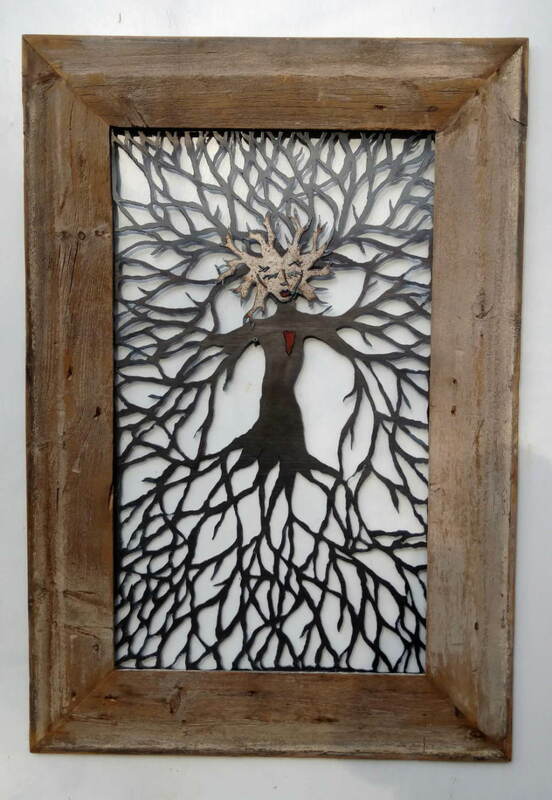 Garden goddess design hand-cut into steel and framed in barn-wood. Measures approx. 31" x 45". Found-object piece with base of beaver-chewed wood. Measures 4.5" x 20"
Found-object sculpturemade of wood pieces and pottery. Measures 15" x 33"
"Entwife" design (from Lord of the Rings), hand-cut in steel and set it a barnwood frame. Approx. 26" x 36". 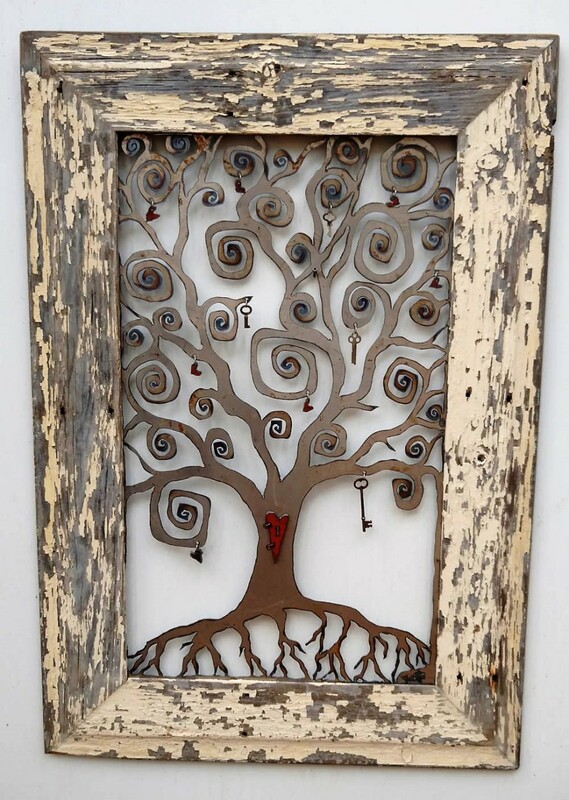 Key to my Heart Spiral Tree design hand-cut in steel and set in a barnwood frame. Small red steel hearts and old keys hanging from branches as accents, and a red heart-shaped steel door in the trunk (with leather hinges and small magnets holding it closed). Measures approx. 26" x 36." 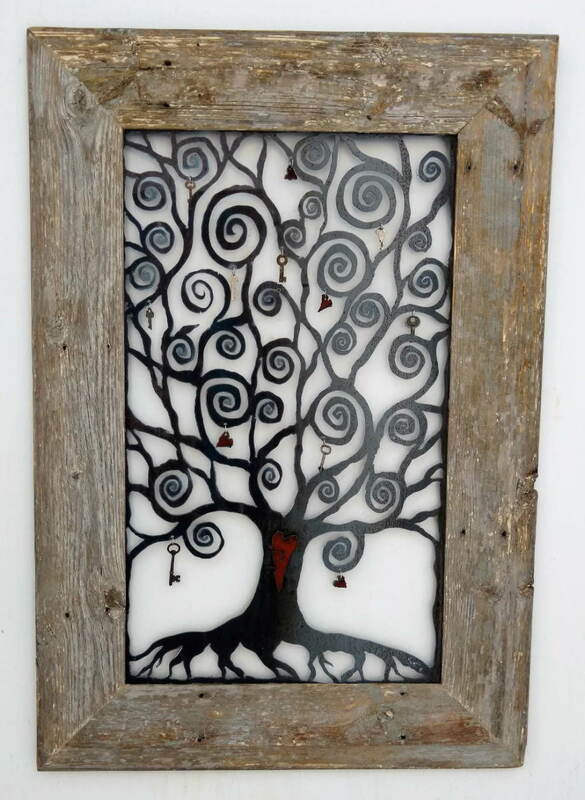 Spiral tree design hand-cut into steel and set in a barnwood frame. Red steel hearts hanging from the branches as accents. Measures 16 x 16." 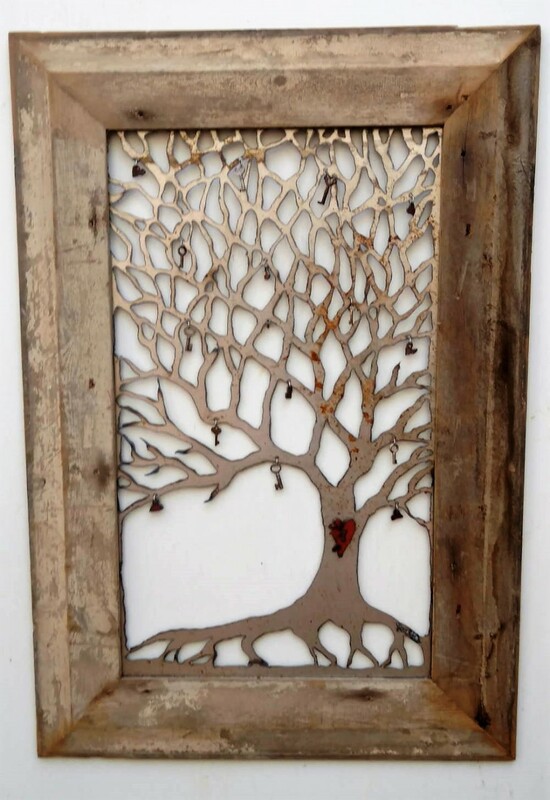 Heart tree design hand-cut into an old saw with a plasma cutter. 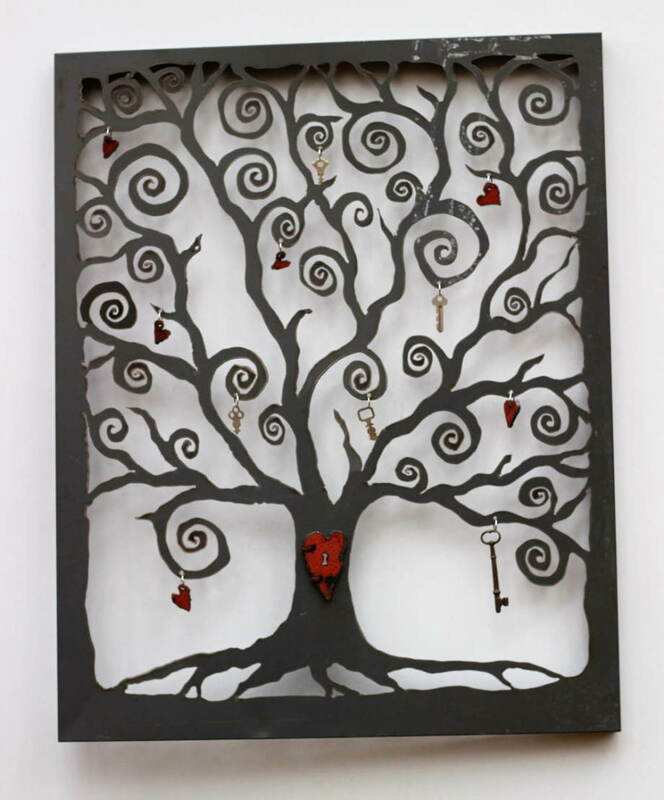 Steel spiral tree design hand-cut with a plasma cutter, with old keys and red hearts hanging from the branches, and a red-heart door (with keyhole) in the trunk. Door is on leather hinges and opens and is held closed with tiny magnets. 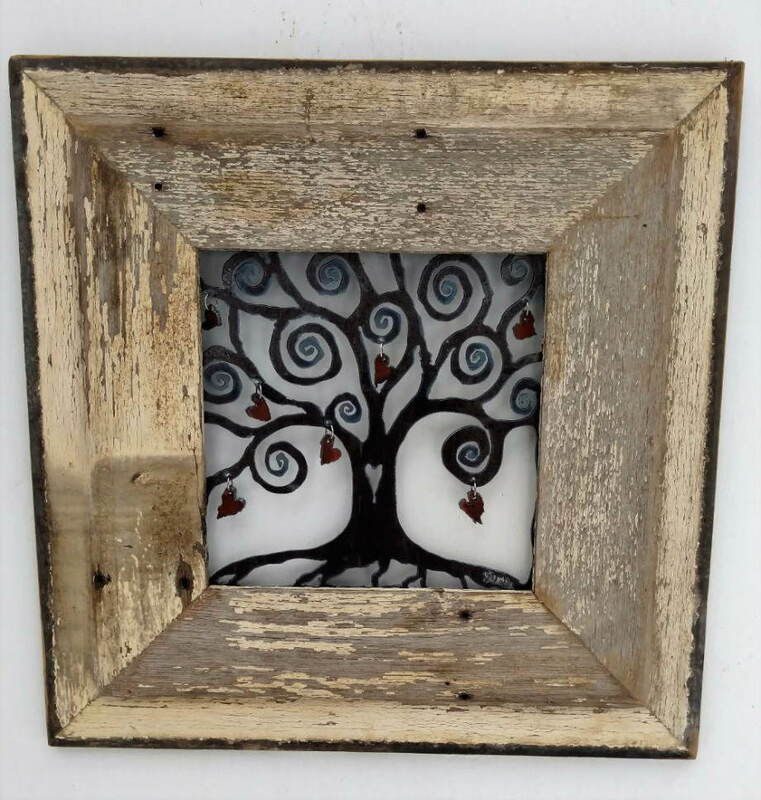 Tree is set into a barnwood picture frame. Measures approx. 26" x 36"
Sorry, this piece has been sold. Please contact me to inquire about similar pieces that are available, or that I can make special for you. 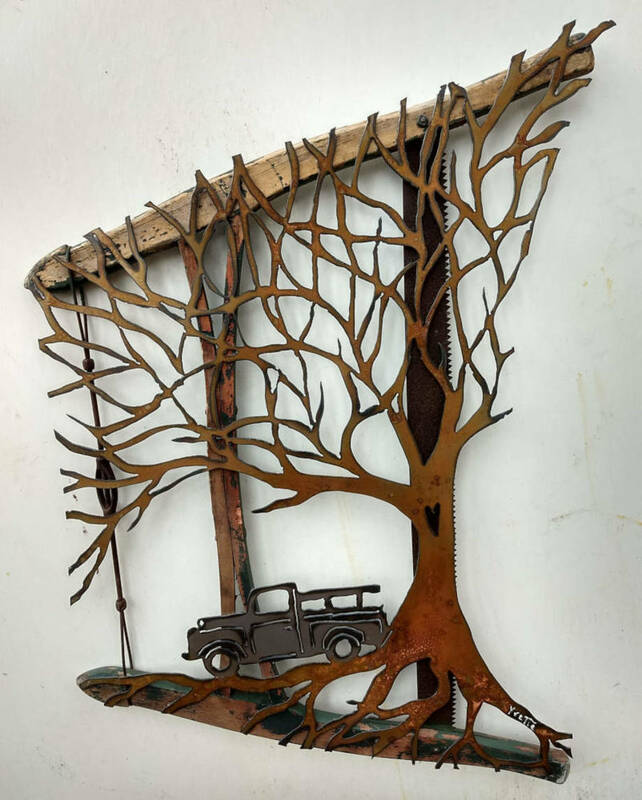 Old truck and tree design hand-cut out of steel and added to an old saw. Design hand cut into an aluminum sled, with steel design added. Measures approx. 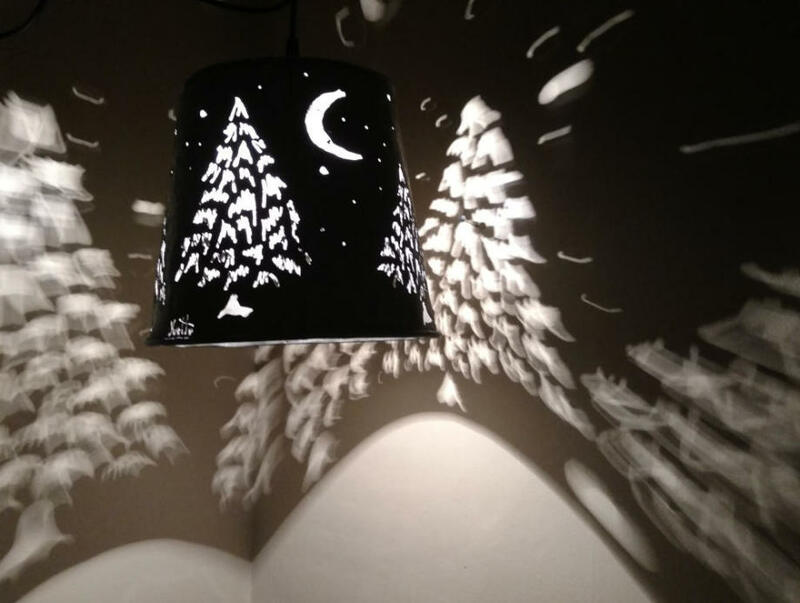 16 x 36"
Pine trees and moon design hand-cut into a galvanized maple syrup bucket and converted into a hanging lamp. Plug-in lamp cord has switch, and LED bulb included. 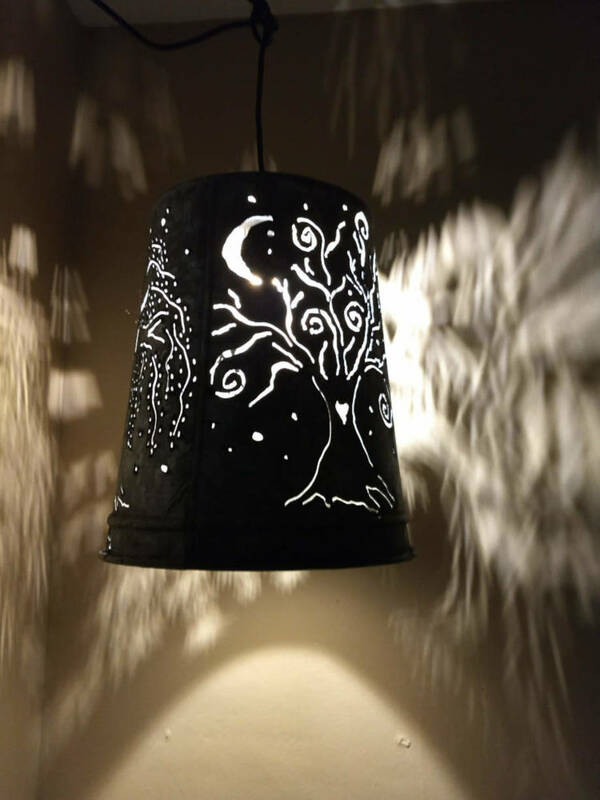 Trees design hand-cut into a galvanized maple syrup bucket and converted into a hanging lamp. Plug-in lamp cord has switch, and LED bulb included. 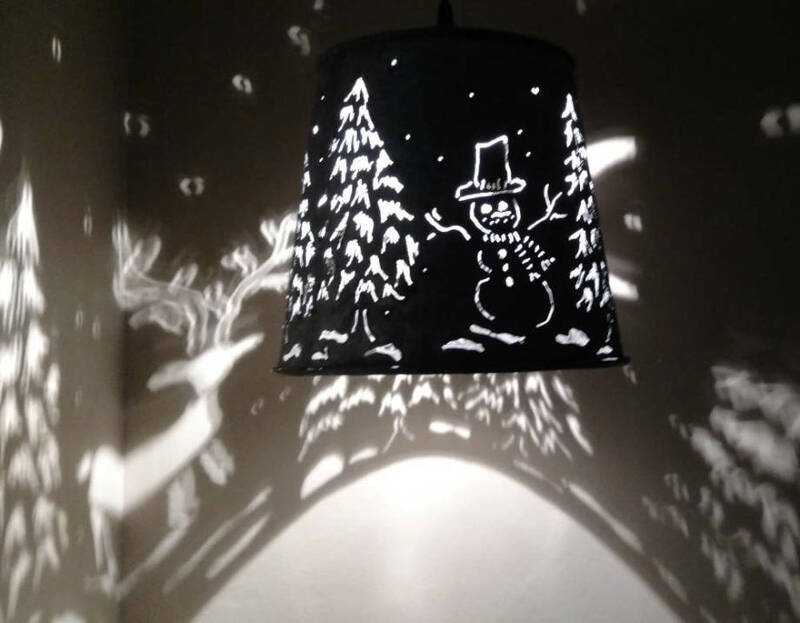 Snowman, pines, and deer design hand-cut into a galvanized maple syrup bucket and converted into a hanging lamp. Plug-in lamp cord has switch, and LED bulb included. 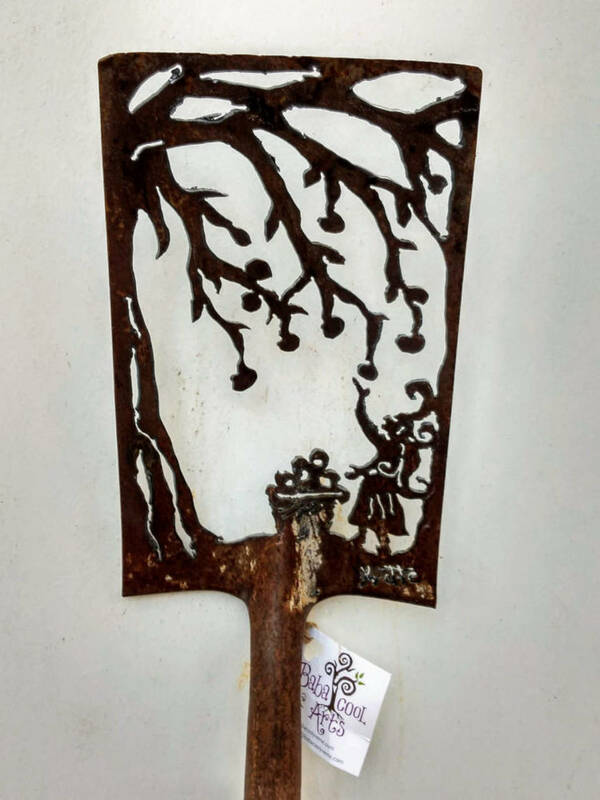 Owl in tree design hand-cut into an antique shovel with a plasma cutter. Nice layer of old cement at bottom of tree, like snow! Owl in tree design hand cut into a shovel with a plasma cutter. 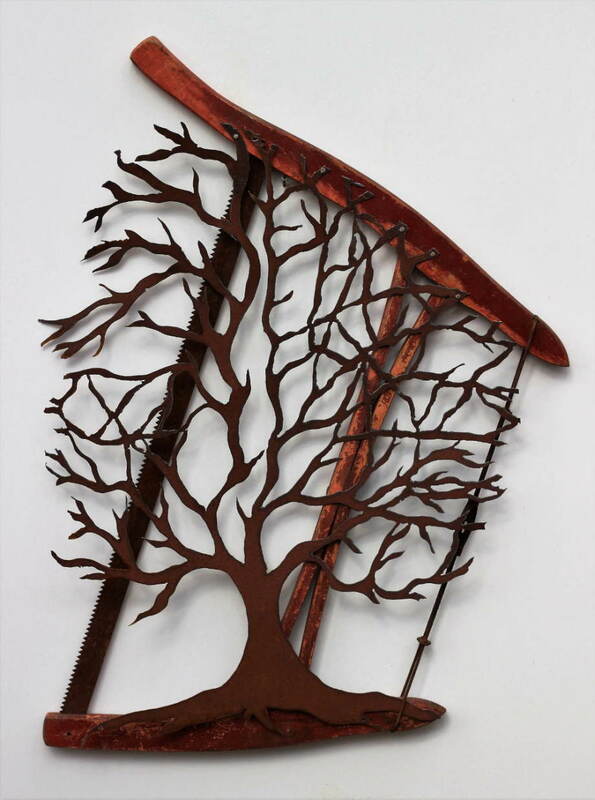 Two trees design, hand cut out of steel with a plasma cutter and set in a barnwood frame. Measures approx. 16" x 24". 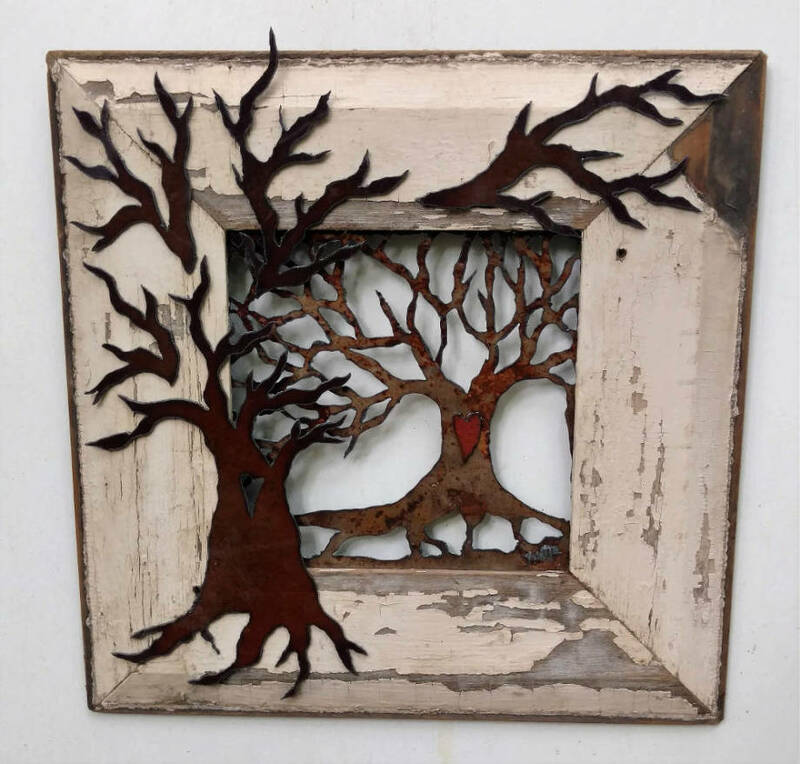 Two trees design hand cut into steel in a barnwood frame. Crescent moon in copper, with small owl. Measures approx. 24" x 36'. 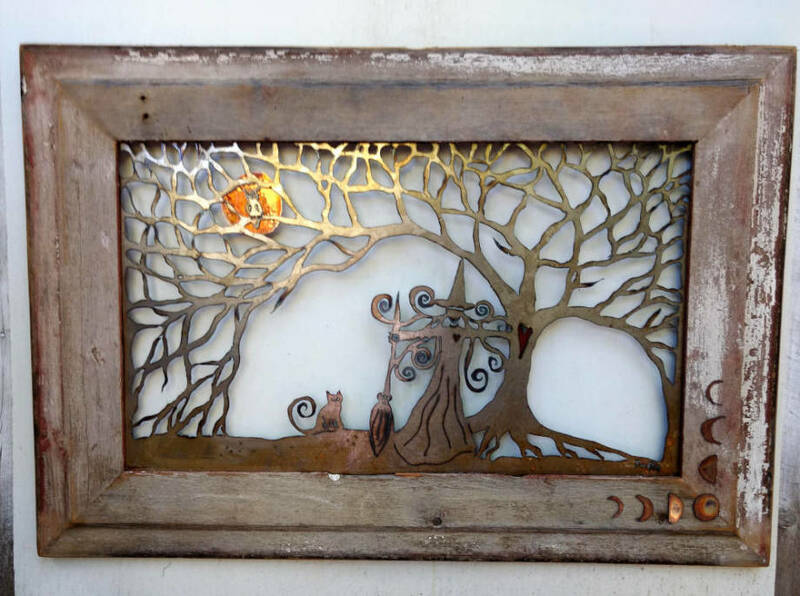 Tree hand-cut into steel, owl in steel, and moon in copper, assembled on a wood panel. 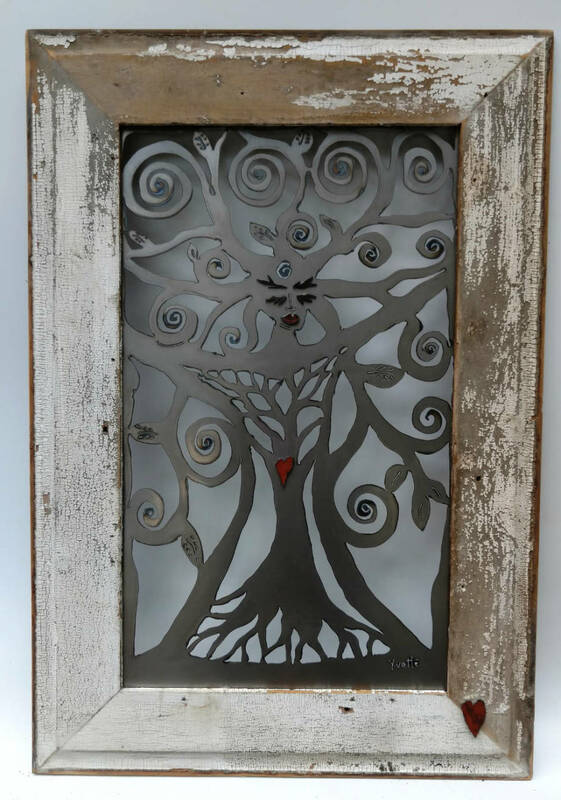 12" x 24"
Tree goddess design hand-cut into steel and framed in barn-wood. Measures approx. 31" x 45". 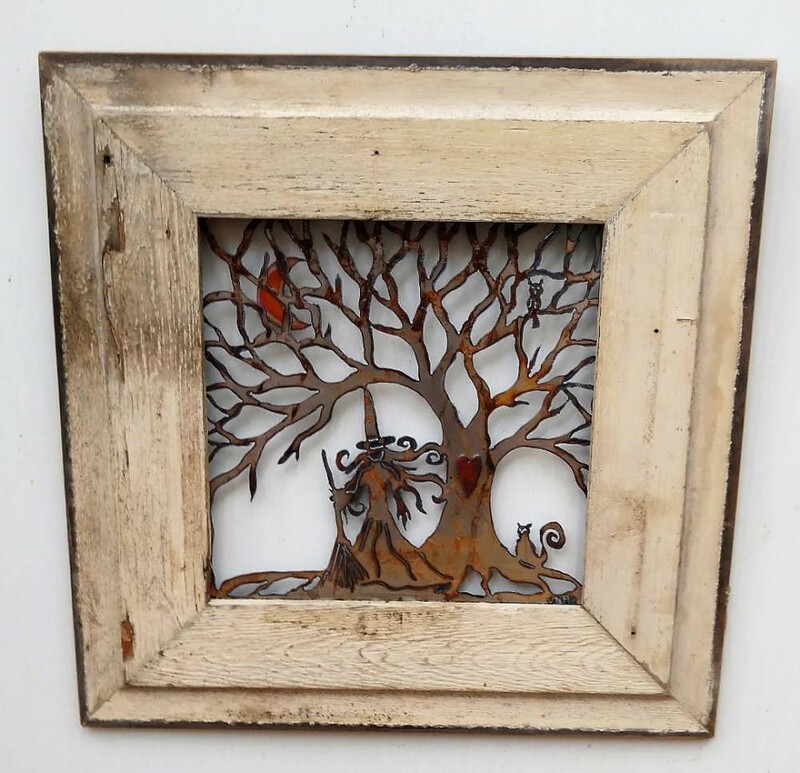 Owl tree design, hand cut into steel with a plasma cutter and added to a barnwood frame Measures approx. 26 x 26". 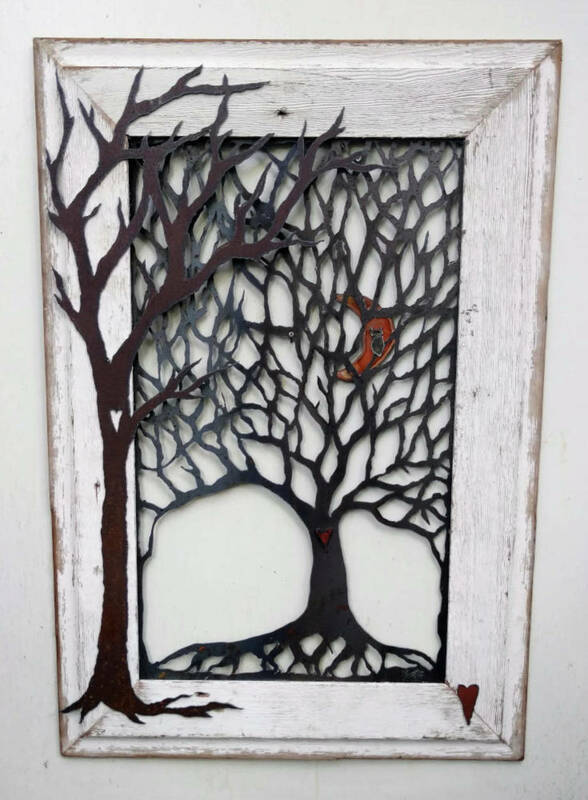 Design hand cut into steel with a plasma cutter and put into a barn-wood frame. Measures 26 x 26". 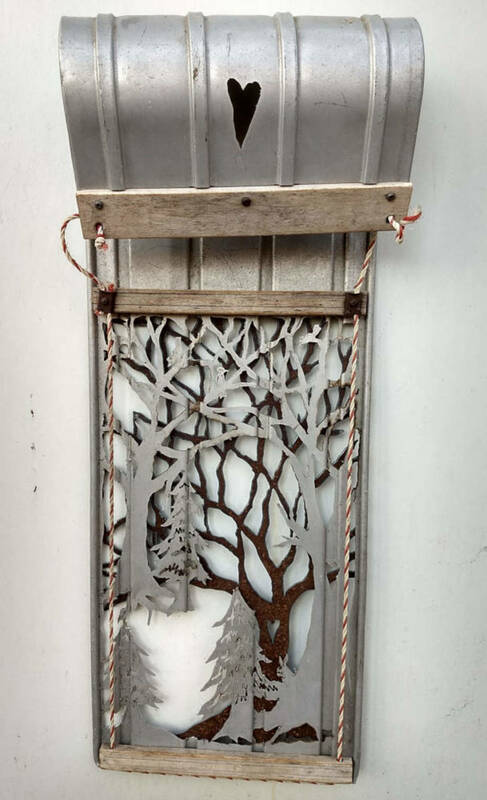 Two trees design with steel and set in a barnwood frame. Measures approximately 24 x 24 inches. 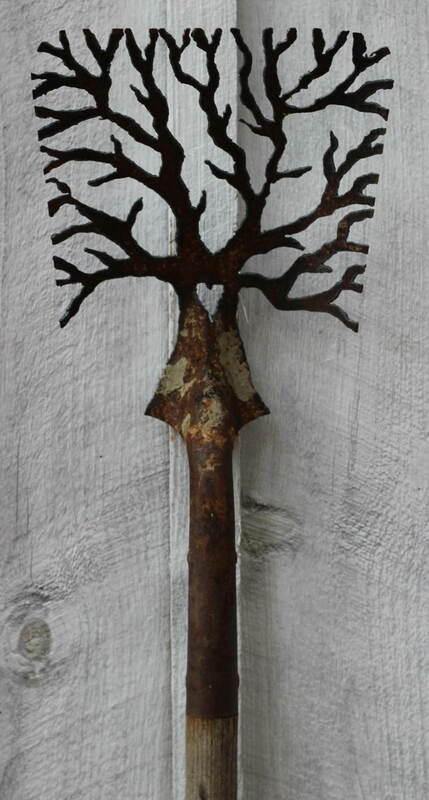 Spiral tree design hand-cut into an antique shovel with solid wood D-handle. 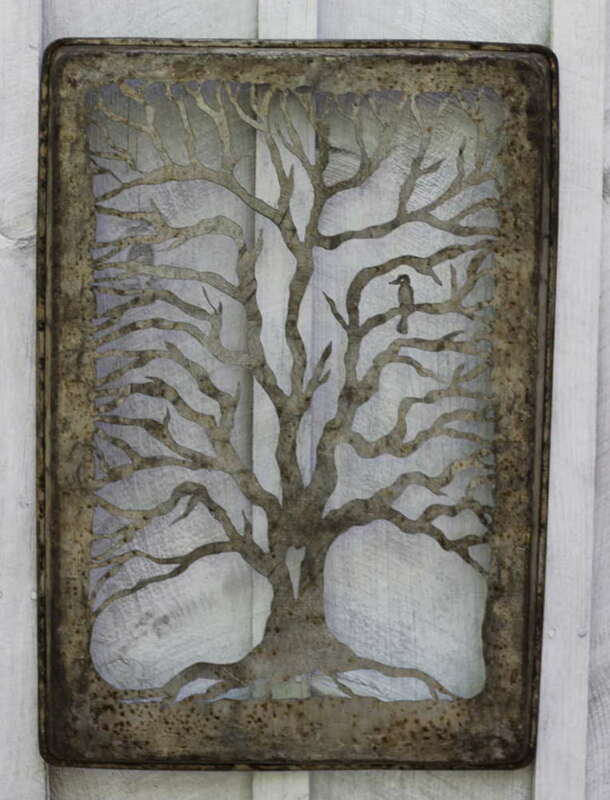 Tree and owl design hand cut into stainless steel tray. 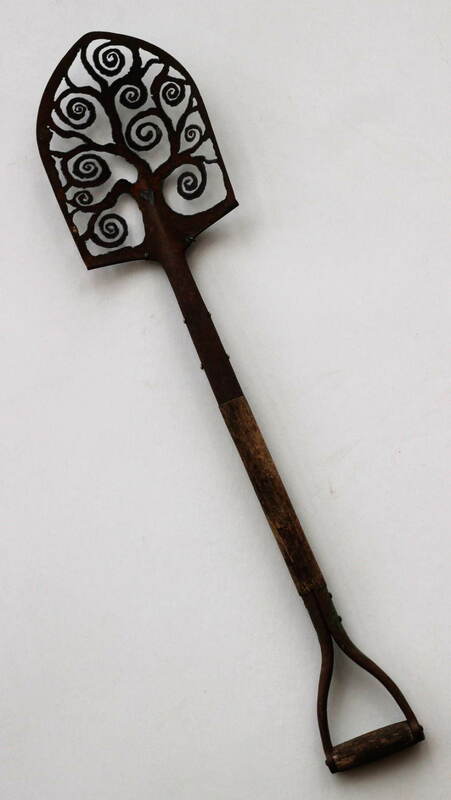 Measures 11.5 x 18.5"
Design hand-cut into an antique shovel. 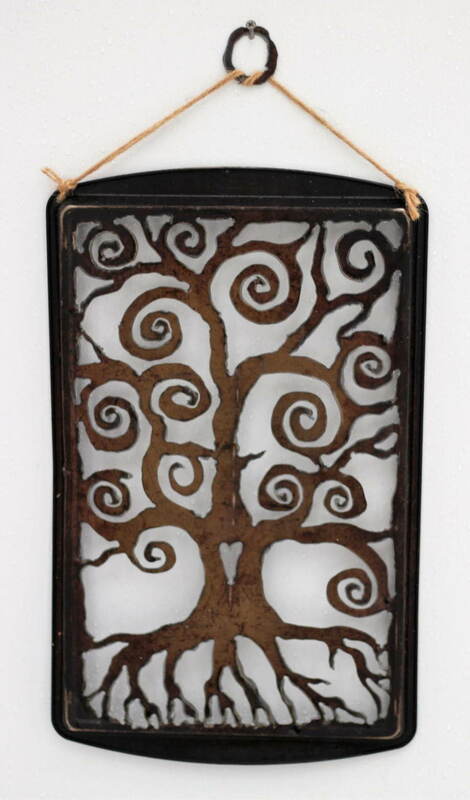 Open (no border) spiral tree design hand-cut into a shovel with a plasma cutter. 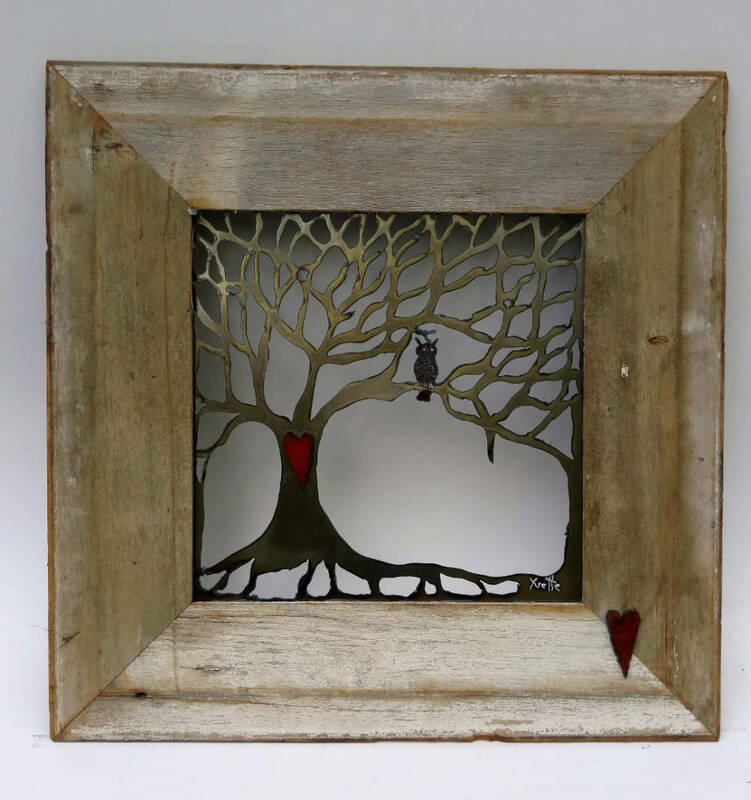 Key to my Heart Tree design hand-cut into steel and set in a barnwood frame. Red steel hearts and old keys hanging from the brances, and a red steel heart door in the tree trunk (with leather hinges and small magnets holding it closed). Measures approx. 21 x 21". 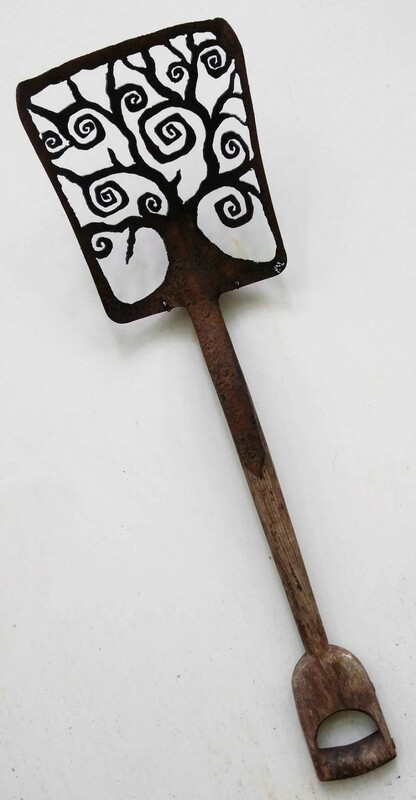 Owl in tree design hand-cut into an antique shovel with a beautiful handle. 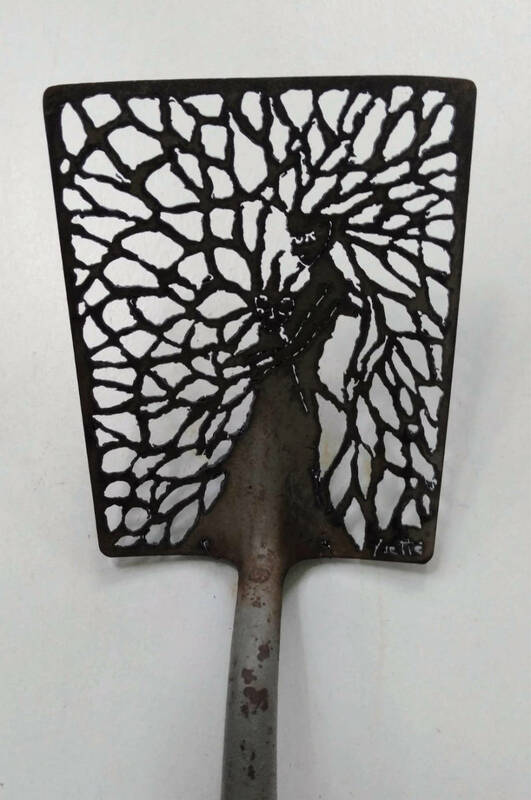 Design hand-cut into a shovel with a plasma cutter. Old broken handle. 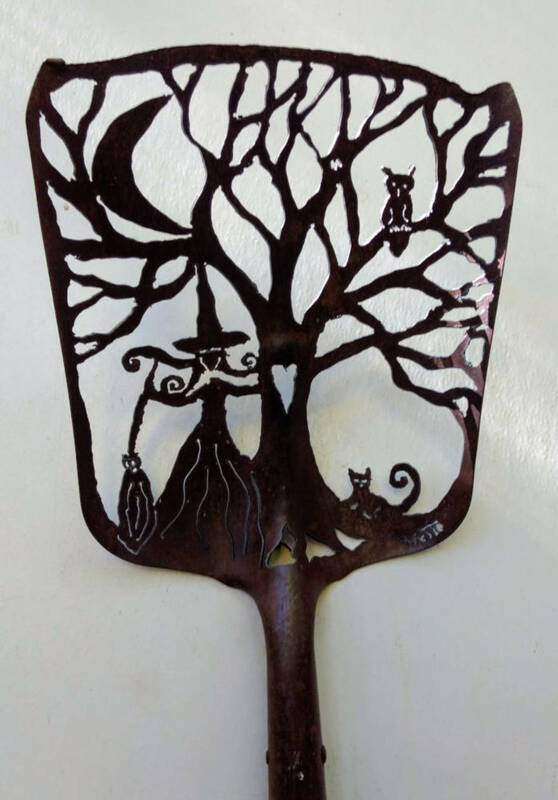 Witch with tree and moon design hand-cut into a shovel with a plasma cutter. 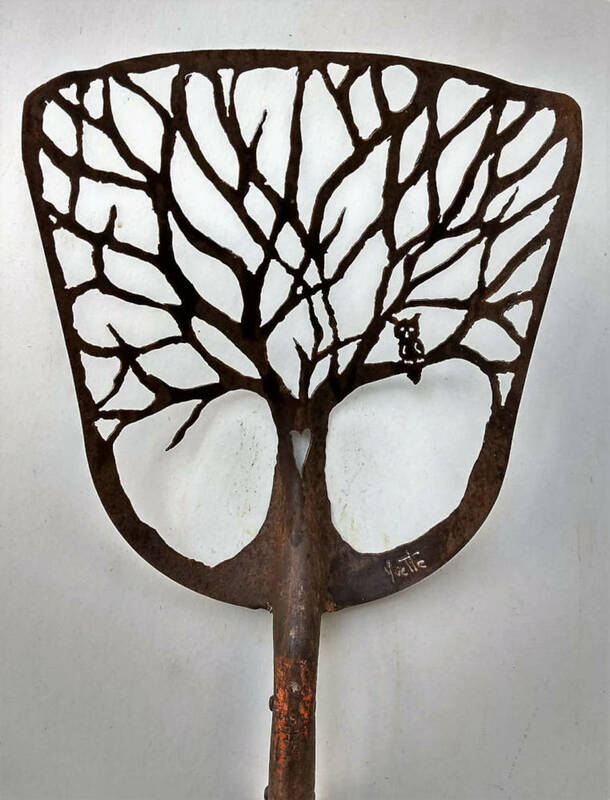 Spiral tree hand-cut into an antique shovel with a plasma cutter. Beautiful D-handle. 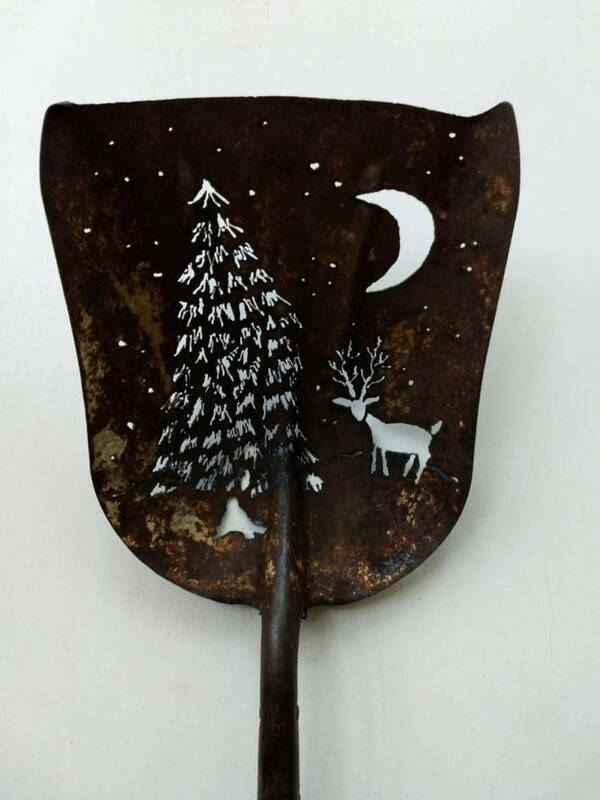 Snowman design hand-cut into an antique shovel with a plasma cutter. 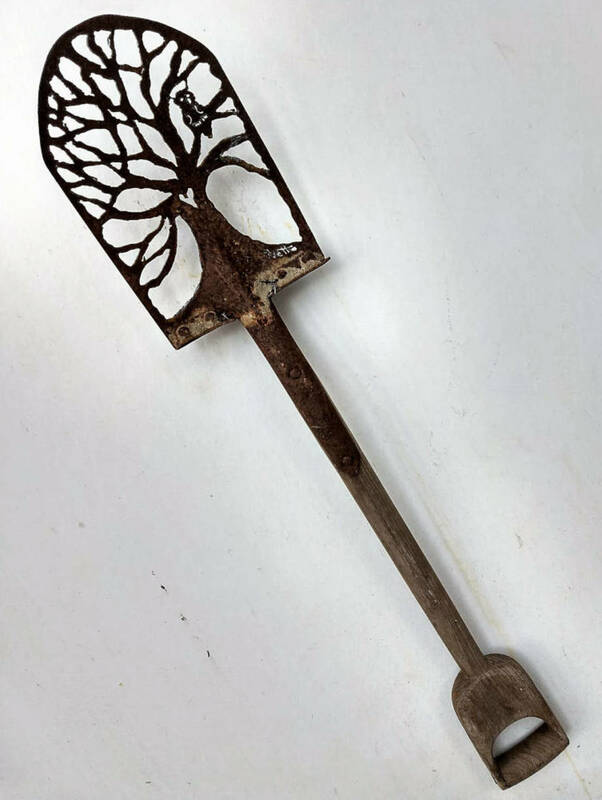 Old oak tree design hand-cut into an antique shovel with a plasma cutter. 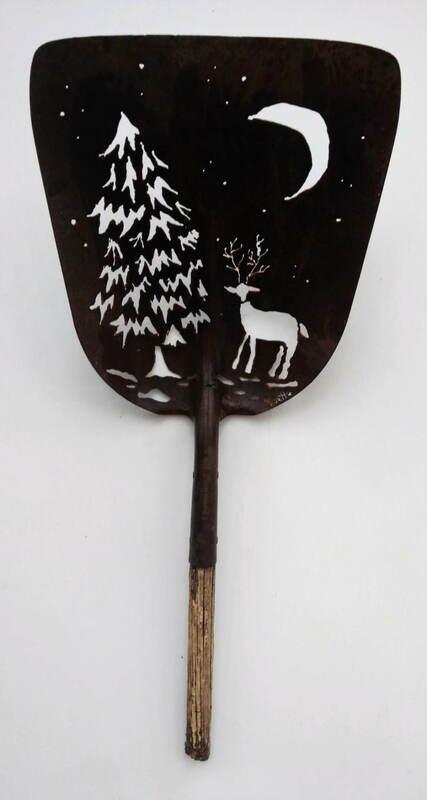 Raven in tree design hand-cut into an antique shovel. 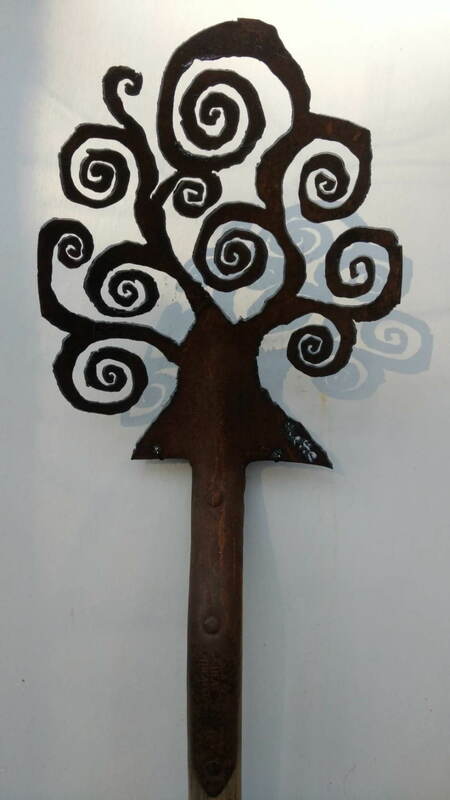 Spiral tree design hand-cut into an antique shovel with a plasma cutter. 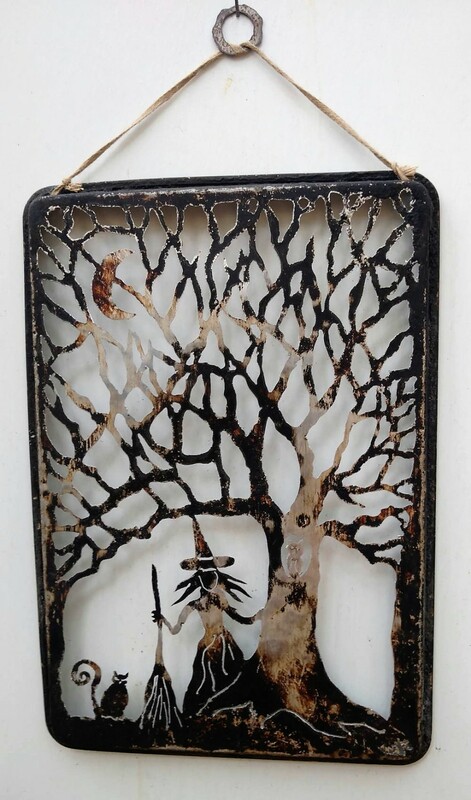 Witch with cat under a tree and crescent moon design hand-cut into a cookie sheet with a plasma cutter. Measures approx. 18 x 24" (pan). 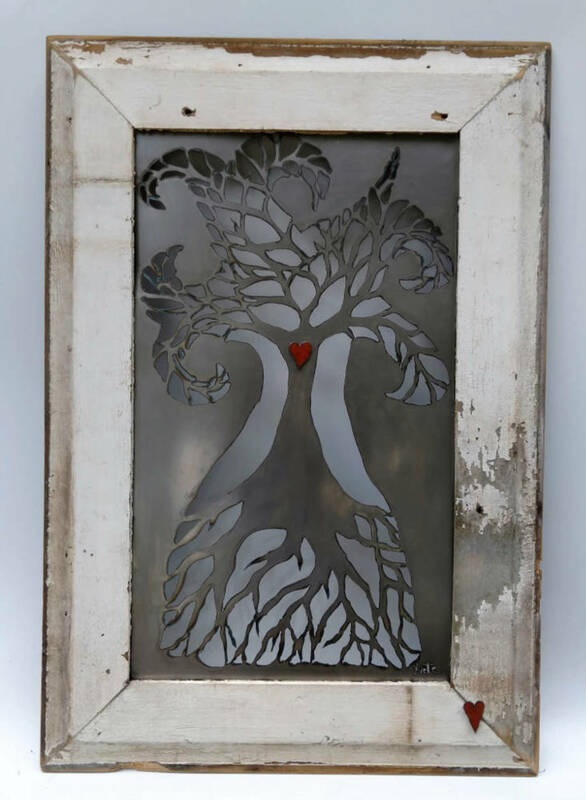 Heart tree design hand-cut into steel with a plasma cutter and in a barnwood frame. Small red hearts and old keys hang from the branches, and red-heart door in trunk (which opens on leather hinges and is held closed with small magnets). Measures approx. 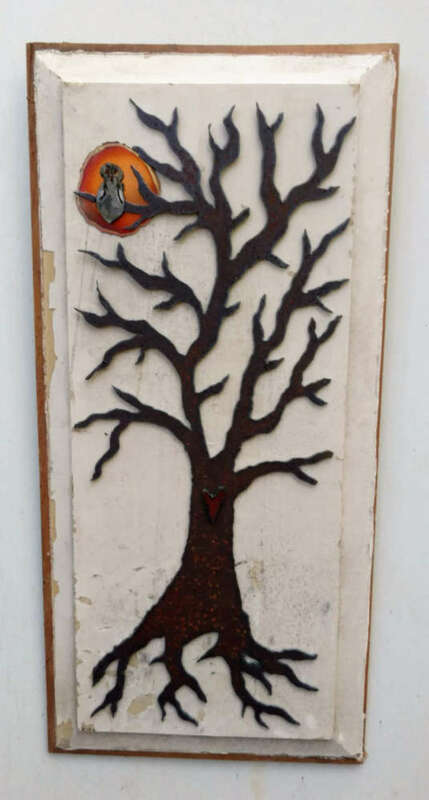 21" x36"
Witch design hand-cut into steel, with red-heart tree trunk and copper moon accents. 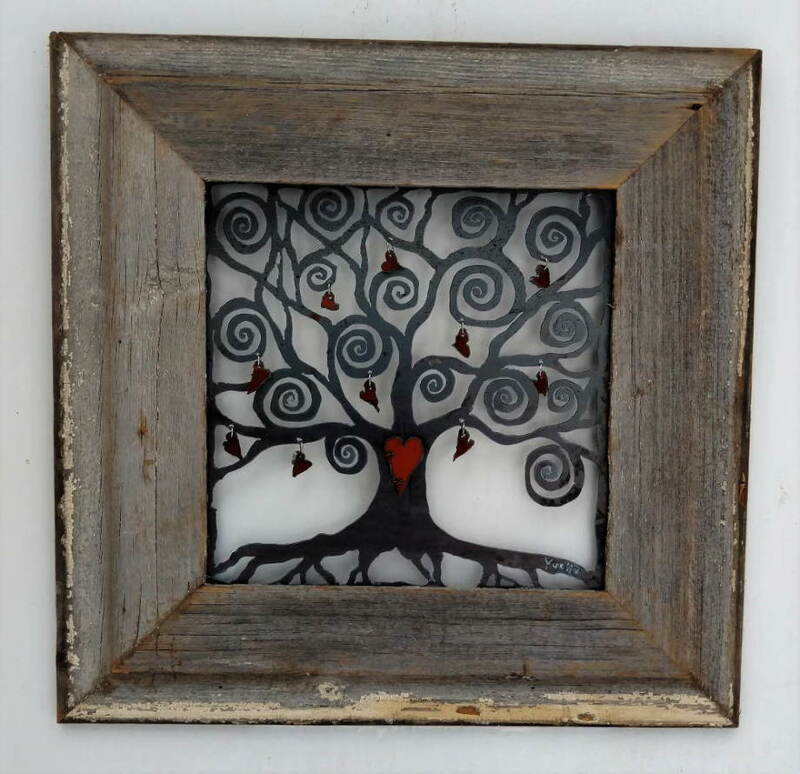 Set in a barnwood frame. Measures approx. 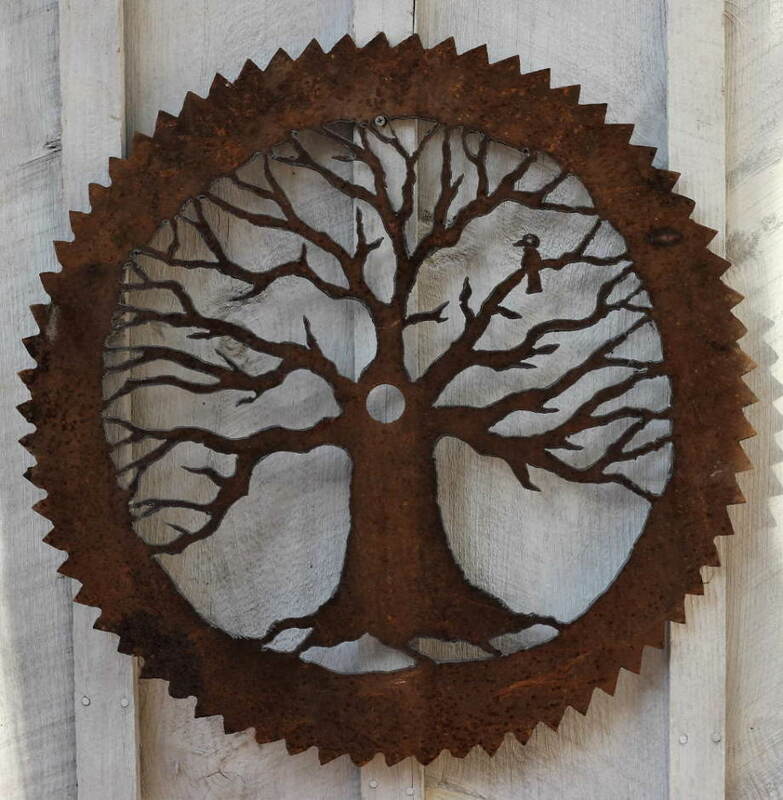 24 x 24"
Hand-cut tree in steel attached to an antique saw. Measures approx. 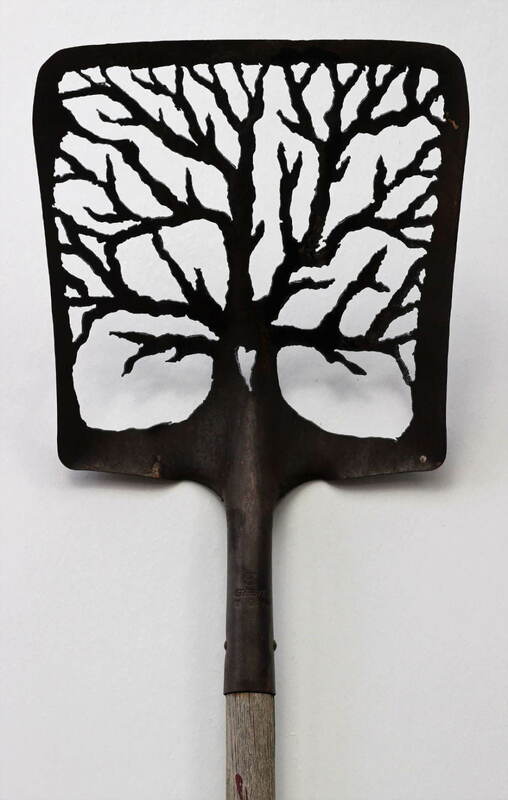 30 x 36"
Oak Tree design hand-cut into a shovel. 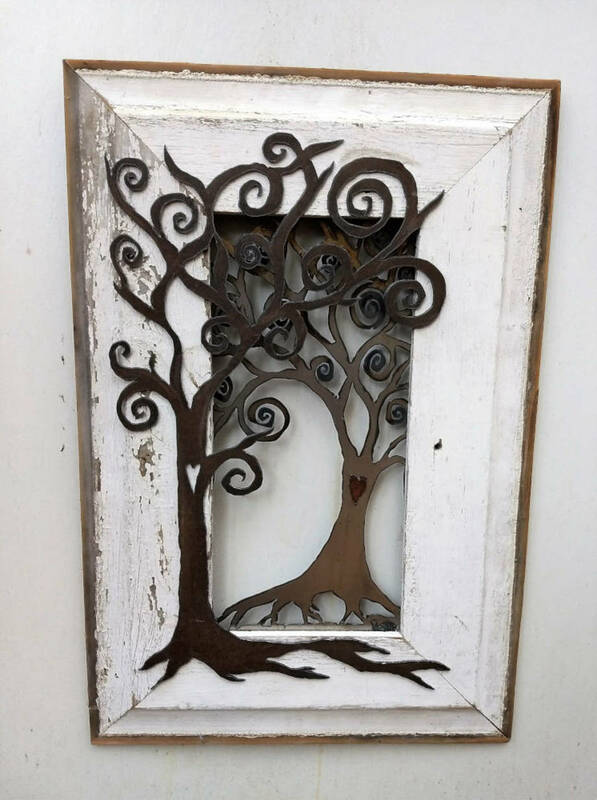 Spiral tree design hand-cut into an old cookie sheet with a plasma cutter. Measures approximately 14" x 20". 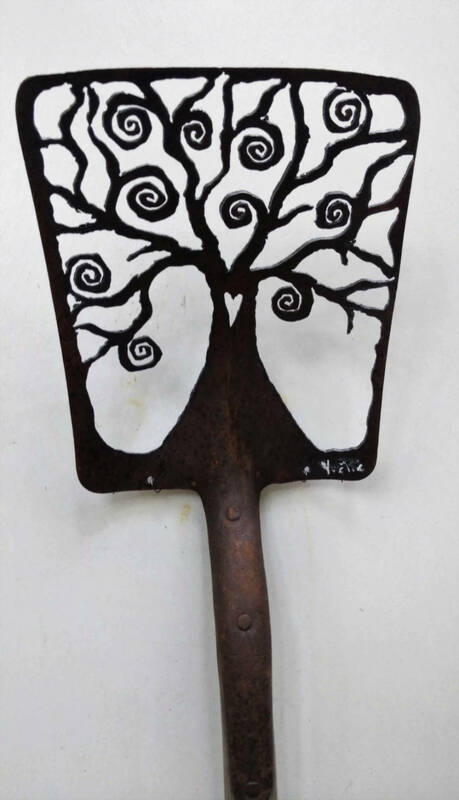 Spiral tree design hand-cut into a shovel. Hand-cut out of a steel panel from an old desk with my plasma cutter, red-steel hearts and old keys added, as well as a red steel door with leather hinges and small magnets to keep it closed. Measures approx. 24" x 32". 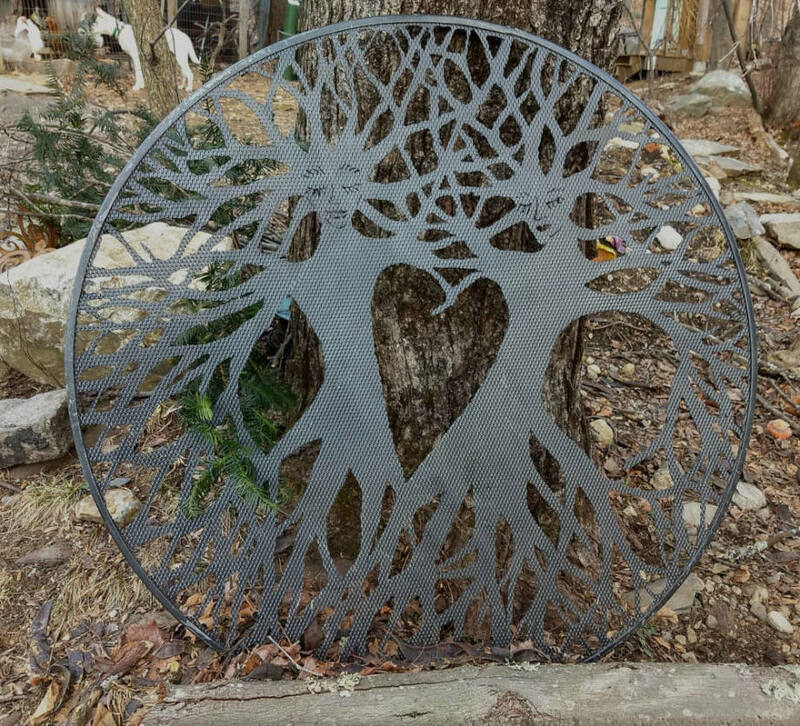 Heart tree design hand-cut into an old saw with my plasma cutter. Design hand-cut into a sawblade with a plasma cutter. 24" diameter. 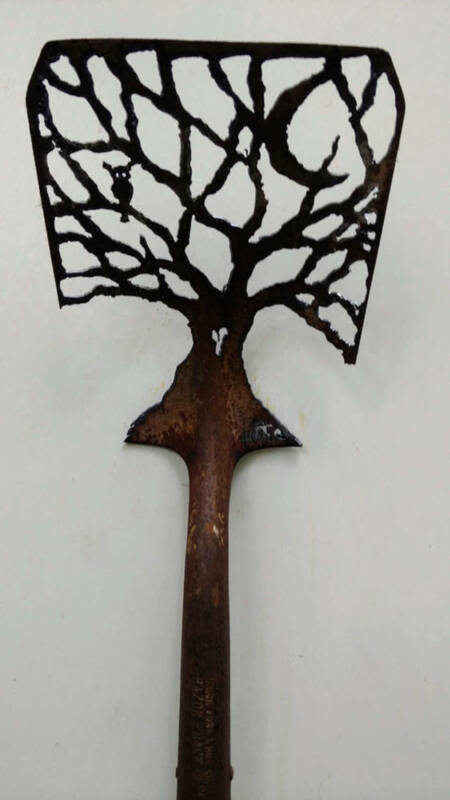 Tree design hand-cut into a shovel with a plasma cutter. 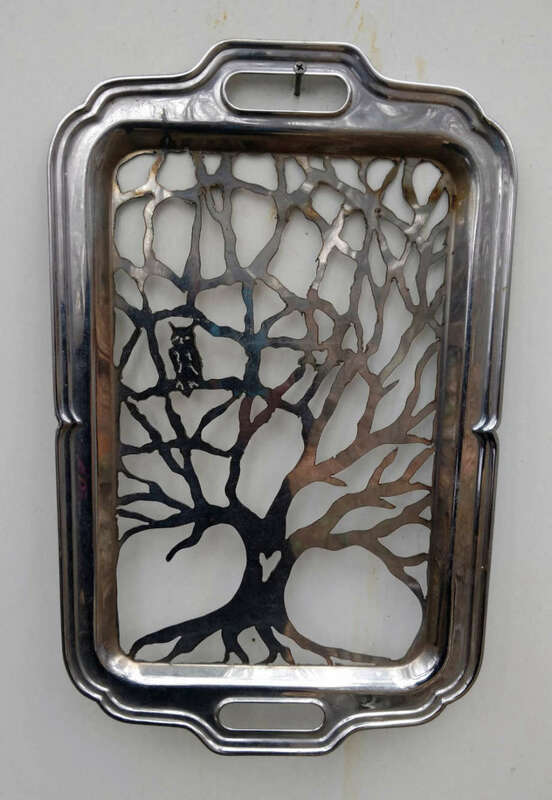 Bird in a tree design hand-cut into an old steel cookie sheet. Approx. 18 x 30".